Olympic Torch Event - Chelmsford, 2012. 6th November 2012 Added the Olympic Torch Event - Chelmsford, 2012. 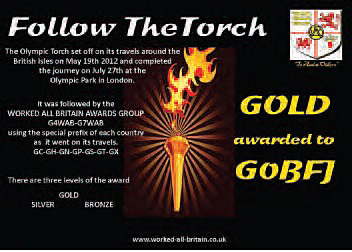 The Worked All Britain Awards Group promoted an Award based upon following the Olympic Torch around UK. Chelmsford was City number 50 which the Torch visited on Saturday, 7th July 2012 and we operated using GX4WAB. Chelmsford will have one SSB station on or near 7.160Mhz, QRM allowing for WAB UK Contacts and others on higher HF frequencies for International contacts using CW and SSB. Look out for us on 2Metres also. Due to the nature of the QSOs, CARS are unable to issue a QSL Card from Chelmsford for GX4WAB - sorry - we have been loaned the Call-sign for one day only. CARS will be listening for QRP Stations and Foundation Licenced Stations on a regular basis and will announce when this will be carried out - CARS will NOT respond to high power stations during this period. Sample of the WAB Award. Thanks to the WAB Group for inviting CARS to participate in the Torch Award. The Olympic torch will tour the UK over a period of seventy days taking in a total of seventy two special events in different parts of the UK, starting at Land’s End on Saturday May 19th and finishing on July 27th at the Olympic Park. The WAB call signs will move around UK following the torch, G4WAB & G7WAB being activated as special event stations using the prefix GX-GT-GN-GH-GS-GP-GC, assigned to the appropriate country. The Award comprises three levels: Bronze – Silver – Gold. All that is required is a copy of YOUR log showing the days/times that you worked either of the two calls. Only the two WAB call signs will count for the Award which is open to all Radio Amateurs and SWL’s. The cost will be £3-00 and certificates will be sent in PDF format unless requested otherwise. As with all WAB activities, all excess income will be donated to charitable causes. WAB has donated in excess of £12,000 in the past 3 years to such causes. Please do not send any claims until after July 28th 2012 when the run is finished and claim the One Award at the level you have reached. Claims have to be with the WAB Award Manager before August 31st 2012. QSL Cards are NOT required for this award. We do not routinely send out QSL cards, but if you require one, please QSL via the bureau to G4WAB. Please note: The spirit of the award is to give all participants an equal chance. Therefore certificates will not be numbered, and there are no higher awards for working more than 30 stations. When calling the station, please bear this ethos in mind and have regard for others, perhaps weaker than you, calling at the same time. If operating the station we ask that you consider stations who's licence does not permit higher power and listen out especially for them and those who are calling from further afield. Payment for claims can be made by PayPal, (details on website), or by post, cheque payable to “WAB Awards Group”. Postal claims please to: Awards Manager, Mr D Chappell G0BWB, 49 Midway, South Crosland, Huddersfield. HD4 7DA.